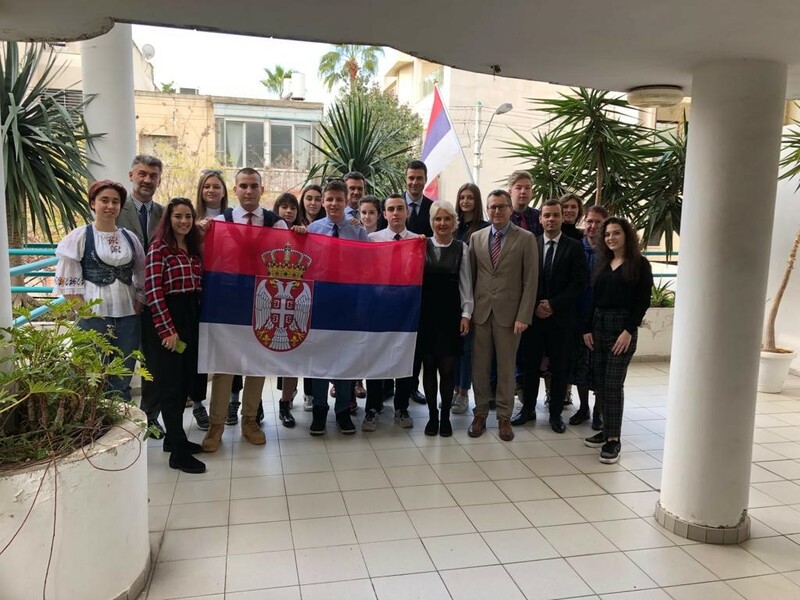 Thirteen students of the 3rd and 4th grade of the XIII Belgrade Gymnasium, escorted by the director Mr. Bojan Vuckovic and two professors, visited Israel from December 20 to 24, 2018. The goal of the visit by the young ambassadors of Serbia, done within the scope of established cooperation between the Gymnasium and Israel Center for Young Leaders, was to promote development of leadership skills, social impact, encouraging volunteerism and social engagement. During their stay, the students had the opportunity to learn about Israeli and Jewish tradition and culture, as well as the specificities of Tel Aviv and Jerusalem. On Sunday December 23, 2018 they visited the Embassy in Tel Aviv, where the Ambassador Milutin Stanojevic explained the basic goals of the Embassy, talked about the history of the friendly ties between the Serbs and the Jews and the current bilateral relations between Serbia and Israel, as well as about the specificities of the diplomatic life in Israel.